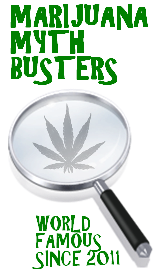 Marijuana Mythbusters » Can you die from smoking too much weed? Feel free to vote in this poll and add your voice to the conversation. You know there is quite a bit of controversy surrounding the topic of marijuana overdose, despite there having been no reported cases ever. Frankly, we just don’t think its possible and neither do 9 out of our 10 visitors. It might be possible that someone with an allergy to marijuana could die from ingesting it, however due to its legal status in many places there has been little research conducted on a marijuana allergy. It is a plant, some people are allergic to certain plants, it only makes sense that certain people would be allergic to marijuana. And of course, everyone has heard the old urban legend, “You can overdose on weed if you smoke your weight.” The Merck Index lists the LD50 (dosage of a certain chemical which will kill half of a population given that dosage) of pure THC to be 42 mg per kg of body weight for rats when the THC is inhaled. What does this mean for us? The lesson I learned is, if you have pure THC, please, don’t waste it getting rats high. Now, let’s make some assumptions with this Merck Index LD50 of 42mg/kg. So, let’s assume we have a 75kg person (165 lbs) and that this LD50 also applies to humans, that gives us 3150 mg or 3.15 g. But, even hash oil isn’t pure THC, neither is hash, nor is weed itself. Assuming that you have the best hash oil in the world and it is 90% pure, you would need to smoke 3.5 grams in order to have a 50% chance of dying. Assuming you have some awesome hash and it is 70% pure, you would need to smoke 4.5 grams in order to have a 50% chance of dying. And lastly, assuming you have some top shelf weed from a dispensary and it has a 20% purity, you would need to smoke 15.75 grams in order to give yourself a 50% chance of dying. Personally, I’ll stick with these numbers and assume that they are correct and that all the assumptions are correct. I still think it is impossible to overdose on marijuana, because 99.9% of people (in my opinion) would be fast asleep before smoking 3.5 grams of hash oil, 4.5 grams of hash, or 15.75 grams of pot. Anyone who could smoke more than these amounts has likely built up a tolerance to THC ala Johnny Depp in his roles as George Jung in the movie Blow. So, where does this leave us. Well let’s start with the basics, it’s impossible to overdose on marijuana. But, if you could effectively smoke your body weight in a short period of time without falling asleep you maybe will die. Seeing as you can’t, there’s really nothing to worry about unless you are allergic. Of course if you are allergic to marijuana, you are probably allergic to the pollen and would be perfectly fine inhaling marijuana smoke. But, that’s enough of what we have to say. Vote in our poll, and feel free to posts any comments or questions you may have. If you are going to attempt to smoke your weight in marijuana, please contact us directly at mjmbmail@gmail.com as we would like to help document, administer, and participate in your experiment. This entry was posted by Mythbuster on September 7, 2011 at 7:25 pm, and is filed under Pot Polls. Follow any responses to this post through RSS 2.0.You can leave a response or trackback from your own site. No. You couldn’t possibly smoke enough pot to kill yourself. I can’t say I’ve ever tried to, but there isn’t any documented deaths resulted from smoking marijuana. It is important to note that smoking isnt the only way to ingest THC. If you made a wicked strong batch of cannibutter and binged on it, I’m sure you could overdose and get very sick. I still doubt that it’d kill anyone. I suppose the same is true from taking THC pills but to be completely honest, it’s a far cry from the plant itself. It’s a man-made chemical compound. If anybody dies as a result of smoking pot it’s probably because they did something very stupid while high out of their minds. My husband and I also skemod a lot before having children. We quit about 8-12 months before conceiving. Mainly b/c we wanted to make sure we could get over the habit, grow up and mature some. In my opinion pot head parents are less than ideal. As for how long it is in your system for the female, only when you smoke it, like nicotine. For males, it can affect the sperm for a few months. It can make the sperm slower swimmers and lower the count as well. Break your habit first. Be responsible. die from weed? Impossible if so me & a lot of my friends are zombies lol any good luck setting that world record if you do shout me out!! die from weed? Impossible of so me & a lot of my friends are zombies lol any good luck setting that world record if you do shout me out!! While It’s technically possible you would have to have it pumped into you when you passed out from smoking to reach lethal dose. As far as we’re concerned, it’s humanly impossible. One person cannot cause themselves to overdose on marijuana/THC. It could possibly contribute to death. I know weed gets your heart rate up, if you smoked a lot of high grade stuff through a vaporizer (otherwise I think your throat would get too chewed up and you’d just stop) maybe it could cause a heart attack? But for a healthy person, without any allergies smoking joints? No way, your throat would get sore forcing you to stop or you’d just pass out. No chance of death at all. Thanks for the input. Glad to know we’re all on the same page. Oh come on. Who voted yes?